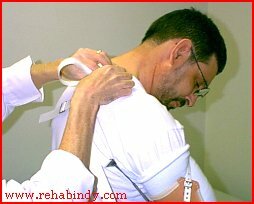 The new prosthesis is checked for fit and and range of motion, also the alignment of the triceps pad is checked. This complete process is then repeated on Rene's other limb. Satisfied with the fit and alignment of both prosthesis the control harness is set in place. Adjustments are made to the harness until Rene is comfortable with the fit and his function of his new prosthesis. After several adjustments and a few minor changes, Rene's fitting is completed. Rene will now be rescheduled as needed for any further adjustments or changes to maintain a proper fit. The Rehab Indy staff would once again like to thank Rene for allowing us to document his visit's. 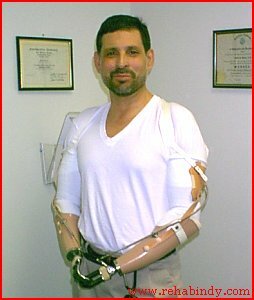 As Rene pointed out, one his biggest concerns after his accident was the lack of knowledge about prosthetics and the care that he would receive. He hopes that by participating in this project he can help give the next new amputee a better understanding of the journey that is ahead of them.